This book just keeps getting better and better, and I mean that in the most honest and objective way. 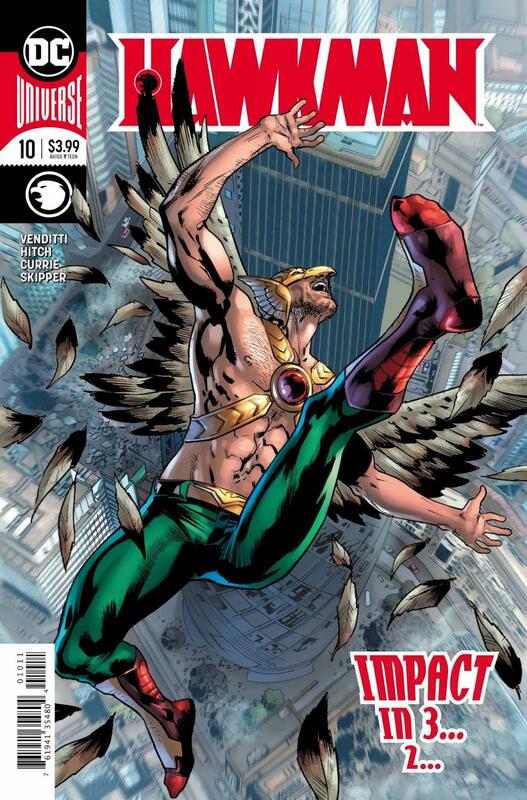 Bryan Hitch and Robert Venditti are telling the definitive Hawkman origin story, and they're doing it in a way that embraces the character's complicated past in a way that has me excited for fans of the character. The scale of the last issue made for an easy and quick read, but Bryan Hitch tones down the scale and delivers on pure character scenes, with the obvious destruction sprinkled in every once in a while. Hitch keeps things expressive and focused with the scenes between Hawkman and his old friend Idamm. I have to say, I love the inkwork that Andrew Currie and Hitch himself bring to the pencils. A complaint of Hitch I had in the past was that the inking on his pencils didn't bring out the best of his work, but here his characters have a strong and defined dimension to them. He uses linework to build faces in a way I really haven't seen him do before, so to me this is the best artwork Hitch has ever produced, period. I understand his contributions to widescreen storytelling many years ago but he's achieving a quality now that I personally connect to. There's dynamism and expression in these pages and this might be the best artwork published by DC right now. I've also had problems with Robert Venditti and his storytelling decompression, but here he throws enough out there so as to satisfy me on a single-issue level. This was a pretty complete issue with a defined beginning, middle, and end, and the journey that Hawkman goes through in this issue alone is a pretty nice look at what makes the character tick, as well as revealing how the rest of this story will play out. Frankly, it's pretty exciting and I can't wait to read more on a simple plot level.